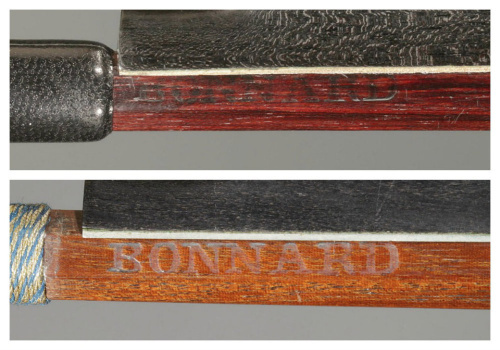 François Bonnard (1801, Luxeuil-les-Bains – 1846, Mirecourt) was one of the many talented French bow makers working in the 19th century, yet until recently his work had gone unnoticed. Last summer, an antique dealer from Paris called me and said: ‘Pierre, I’ve got a bow stamped “Bonnard”. It is an early 19th-century bow with a large stamp like those by Fonclause or Adam.’ I saw the bow and decided to find out more about the life and work of this unknown bow maker. Violin maker Roland Terrier kindly provided me with a family tree compiled from the birth certificates of the Bonnard family. The father of our bow maker was a clock maker born in 1767 in Luxeuil-les-Bains, in the region of Franche-Comté, and who died in Mirecourt in 1818. His wife gave birth to three children, out of whom Charles Odat (born in 1797) would become a violin maker and François would turn to bow making. Records from the time show many clock makers arriving in Mirecourt between 1800 and 1820. As well as being the capital of violin making in France, it was also renowned for its manufacturing of mechanical instruments, such as organs and serinettes. François Bonnard was 13 when his family moved to Mirecourt and he probably started his apprenticeship as a bow maker soon afterwards. The Bonnard family settled in Mirecourt when the town was undergoing many changes as a consequence of the French revolution, such as the decline of foreign trade relations, which seriously affected many workshops at the beginning of the 19th century. Some bow makers such as Claude Joseph Fonclause, Michel Genin, Dominique Peccatte and Pierre Simon decided to try their luck in Paris, thus increasing a trend that started in the 18th century. Others traveled regularly to the capital for business, including Nicolas Maire and Etienne Pajeot, who exhibited his work for the first time in Paris in 1819. It seems that François Bonnard could not write, as we learn from a note on the marriage certificate of his sister, whose wedding took place on May 20, 1834 in Mirecourt. All witnesses signed the certificate, ‘with the exception of the spouse’s brother, who declared he was not able to sign it.’ Perhaps Bonnard’s illiteracy accounts for his lack of geographical mobility and his fall into oblivion in the history of bow making. The quality of Bonnard’s bows is remarkable, as much for the precision of the craftsmanship as for its aesthetics and strong personality. His work is part of the Pajeot school and it is likely that he was apprenticed to Pajeot’s workshop, which was then the most active and prestigious in Mirecourt. As with Pajeot, the metalwork is precise: one-piece heels are bent and adjusted to perfection, and a lasting screw and eyelet system is in use. Large mortises are cut out on the stick. The frogs are rather low and shallow, and their throats are evenly rounded, as in Pajeot’s work, but not as deep. Some of Bonnard’s heads show the strong stylistic influence of early bows by Claude Joseph Fonclause. The similarities are so striking that the work of the two bow makers could easily be mixed up. Fonclause (1799–1862) was born two years earlier than Bonnard, also in Luxeuil-les-Bains. Would this have forged a complicity between both bow makers after they moved to Mirecourt? As with Fonclause, Bonnard’s heads are square and give the impression of being rather solid, although they are quite thin on top. Chamfers on the head are fine and slope inwards. Bonnard’s imposing branding iron is very distinctive. The font is known as ‘lettres à pied’ and falls into the tradition of Mirecourt bow makers of that time. It is very similar to Henry J.V., Adam or Fonclause’s stamps, but here the font is even larger in size. It is fascinating to study the life and working conditions of 19th-century bow makers as well as the stylistic development of their work. This gives us a rich context that helps to guide the work of today’s makers. I will continue my research and thank in advance anyone who will kindly share information on the subject. Thanks to musicologist Hélène Sechehaye for her archival research in Vosges and to bow maker Jean-François Daguin for sharing his collection, including a François Bonnard bow. Pierre Guillaume is a bow maker, expert and appraiser based in Brussels.